The Manstein Plan was the primary war plan of the German Army during the Battle of France in 1940. Developed by Generalleutnant (Lieutenant General) Erich von Manstein, the plan greatly modified the original 1939 versions of the invasion plan, Fall Gelb (Case Yellow) by Franz Halder, for the Battle of France. One way to look at the Manstein Plan was that it was the German response to the French Dyle Plan. Originally, in Aufmarschanweisung N°1, Fall Gelb (Campaign Instruction No 1, Case Yellow), the Germans planned to push the Allied forces back through central Belgium to the Somme river, in northern France, similar to the 1914 campaign of the First World War. On 10 January 1940, the Mechelen Incident occurred, when a German aircraft carrying documents containing parts of the operational plans of Fall Gelb crashed in Belgium, thus prompting another review of the invasion plan. While Fall Gelb was revised by Halder, not fundamentally changing it in Aufmarschanweisung N°3, Fall Gelb, Manstein was able to convince Hitler in a meeting on 17 February, that the Wehrmacht strategy should be an attack through the Ardennes, followed by an advance to the coast. Manstein, chief of staff of Army Group A, had originally formulated his plan in October 1939 in Koblenz on instigation of his superior General Gerd von Rundstedt, who rejected Halder's plan, both because of professional jealousy and because it would not lead to a decisive victory over France. Manstein's first thoughts followed Vernichtungsgedanke, envisaging a swing from Sedan to the north, rapidly to annihilate the Allied armies in a Kesselschlacht (cauldron battle). When discussing his intentions with Lieutenant-General Heinz Guderian, commander of the XIX Panzer Corps, the latter proposed to turn it into a strategy following the thinking of J. F. C. Fuller, by avoiding the main body of the Allied armies and swiftly advancing with the armoured divisions to the English Channel, to cause the Allies to collapse by catching them off guard and cutting their supply lines. It was thus Guderian who introduced the true "Blitzkrieg" elements to the plan, while Manstein had at first many objections against this aspect, especially fearing the long open flank created by such an advance. Guderian managed to convince him that the danger of a French counterattack from the south could be averted by a simultaneous secondary spoiling offensive to the south, in the general direction of Reims. Guderian before the war had generated much interest for the theories of Fuller but never fully endorsed them. When Manstein first presented his ideas to the OKH, he did not mention Guderian's name and made his classical swing to the north the main effort, while a limited number of armoured divisions protected the left flank of this movement, acting in a classical cavalry strategic reconnaissance role. These changes did not reflect a change of mind on his part, but were thought necessary by him because the original conception was too radical to be acceptable, and many conservative generals also considered Guderian himself as too radical. His views were flatly rejected by Halder and Walther von Brauchitsch, however. Reformulating them in a more radical sense did not help, and in late January, Halder managed to remove Manstein to the east by having him promoted commander of XXXVIII Army Corps. Manstein and Halder were old rivals: in 1938 Manstein had been the successor of chief of staff Ludwig Beck but had been removed from this position when the latter fell into disgrace with Hitler because of the Blomberg-Fritsch Affair. On 1 September 1938, Halder, not Manstein, had replaced Beck. However, two officers of Manstein's staff, Lieutenant-Colonel Günther Blumentritt and Major Henning von Tresckow, were outraged by Halder's behavior. In late January, they contacted Hitler's personal Army attaché, Lieutenant Colonel Rudolf Schmundt (an old acquaintance of Tresckow's) when he was visiting Koblenz, who informed Hitler of the affair on 2 February. Hitler, having found Halder's plans unsatisfactory from the very beginning, ordered on 13 February a change of strategy in accordance with Manstein's ideas, though having only heard a rough outline of them. The general was invited to the Reich Chancellery in Berlin to explain his plans in person to Hitler on 17 February, during a working lunch in the presence of Alfred Jodl and Erwin Rommel. Though Hitler felt an immediate antipathy against Manstein for being too arrogant and aloof, he listened speechlessly to his exposition and was impressed by Manstein's logic. "Certainly an exceptionally clever fellow, with great operational gifts, but I don't trust him," Hitler remarked after Manstein had left. Halder now had to make a fourth main version of the attack plan, Aufmarschanweisung N°4, Fall Gelb. Manstein would not be further involved in the planning process and returned to his command of the Army Corps. This new plan conformed to Manstein's proposal in this respect that Army Group A would provide the central thrust of the invasion through the Ardennes in southern Belgium. After crossing the Meuse River between Namur and Sedan, Army Group A would then swing northwest towards Amiens, while Army Group B executed a feint attack in the north to lure the Allied armies into the trap. However, in many ways, the plan was fundamentally changed by Halder. It no longer envisaged a simultaneous secondary attack to the south. Also, the "Blitzkrieg" elements were largely removed. The river crossings were to be forced by infantry and there would be a long consolidation phase during which a large number of infantry divisions would be built-up in the bridgeheads. The armoured divisions should then advance in a coherent mass together with the infantry divisions. There would thus not be an independent deep strategic penetration by the German armour. In deviation of the official plan, Guderian and the other panzer generals, Rommel among them, disobeyed orders and quickly advanced to the English Channel. The panzer forces captured Abbeville and fought the Battle of Boulogne and the Siege of Calais, only temporarily being halted by Hitler's orders on 17, 22 and 24 May, then advancing again and fighting the Battle of Dunkirk. The effects of the Manstein Plan were devastating for the Allied armies, as they were encircled by Army Groups A and B, leading to Operation Dynamo, the evacuation from Dunkirk. The losses in the north and resulting lack of mobile reserves led to the defeat of the remaining French forces and complete victory over France. This resounding success came as a complete surprise even to the Germans, who hardly had dared to hope for such an outcome. Most generals had vehemently opposed the plan as being much too risky; even those supporting it had mainly done so out of desperation because the geostrategic position of Germany seemed so hopeless. Count Ciano later in the war observed that "victory has a hundred fathers, but defeat is an orphan" and Fall Gelb would have no lack of sires. Two of the most prominent were Hitler and Halder. Because Hitler had not liked Halder's original plans, he had suggested many alternatives, some of them bearing a resemblance to the Manstein Plan, the closest being a proposal made by him on 25 October 1939. Soon, Nazi propaganda began to claim that the victory was a result of Hitler's military genius; Hitler praised Manstein with these words: "Of all the generals, with whom I spoke about the new attack plan in the West, Manstein was the only one who understood me!" Halder, after the war, claimed he was the main inventor, supporting this with the fact that he had begun considering to change the main axis to Sedan even before 13 February, indeed as early as September 1939 and that Manstein's original proposal was too traditional. The Manstein Plan is often seen as either the result of or the cause of a mid-20th century Revolution in military affairs. 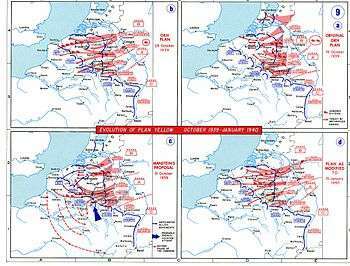 In the former hypothesis, expounded by Fuller and Basil Liddell Hart immediately after the events, the Manstein Plan is presented as a natural outcome of deliberate changes in the German military thinking during the twenties and thirties by Hans von Seeckt and Guderian, implementing Fuller's or Liddell Hart's ideas. If true, an explicit Blitzkrieg doctrine would have been established by 1939 of which the Manstein Plan was but the most spectacular implementation and the Invasion of Poland an earlier example. The doctrine would have been reflected in the organisation and equipment of the army and the Luftwaffe and would have been radically different from the obsolete doctrines of France, Britain and the Soviet Union, except for the contributions of individuals like Mikhail Tukhachevsky, Charles de Gaulle, Fuller and Liddell Hart. That the earliest plans by Halder or Manstein and the final plan by Halder did not conform to this doctrine is then seen as an anomaly, to be explained by special circumstances. In the latter hypothesis, promoted by Robert Allan Doughty and Karl-Heinz Frieser, the Manstein Plan is instead a return to the classic principles of the 19th century Bewegungskrieg, adapted to the potential of modern technology by a sudden and unexpected departure from established German doctrine through the Blitzkrieg elements provided and executed by Guderian. It claims that the influence of Fuller and Liddell Hart in Germany was limited and much exaggerated by the two writers and that no explicit true Blitzkrieg doctrine can be found anywhere in the official pre-war German army records. It finds further support in the fact that German tank production had no priority and that plans for the German war economy were at first based on the premise of a long war, not a swift victory. The hypothesis allows for a gradual implementation during the thirties of technological advances in a shared moderated Bewegungskrieg doctrine used in all the major powers prior to 1940, with subtle differences between the nations. The invasion of Poland was not a Blitzkrieg campaign but a classic annihilation battle. The lack of Blitzkrieg elements in the official German plans for Fall Gelb is seen as the normal and expected outcome of this situation. Only after the sudden success of the radical execution of the Manstein plan by Guderian would Blitzkrieg have been adopted as an explicit doctrine, in this view making Operation Barbarossa the first deliberate Blitzkrieg campaign. Guderian presented the situation in his postwar book Erinnerungen eines Soldaten ("Memories of a Soldier", published in English under the title Panzer Leader), as conforming to the second hypothesis, portraying himself as a lone voice against a reactionary majority of the German officer corps. In 2006, Adam Tooze wrote that the quick victory in France was not the consequence of a logical strategic synthesis but a "risky improvisation" to cope with strategic dilemmas that Hitler and the German military leaders had failed to overcome, before February 1940. The Allies and the Germans had no interest in acknowledging the importance of improvisation and chance in the sensational victory of 1940, a Blitzkrieg Myth was convenient for the Allies to hide the incompetence that had led to defeat. Rather than resort to technological determinism, German propaganda, emphasised the machinery of the German army and that of the Allies but juxtaposed it with the heroic individualism of German soldiers, notably in the film Sieg im Westen (1941). OKW explained the victory as a consequence of the "...revolutionary dynamic of the Third Reich and its National socialist leadership". Tooze wrote that a debunking of a technological interpretation of the German victory in France should not lead to the conclusion that it was the genius of Manstein or the superiority of German soldiers that were the cause of the victory. There was no grand strategic synthesis, the course of the 1940 campaign depended on the economic mobilisation of 1939 and the geography of western Europe. During the winter of 1939–1940 the quality of German armoured forces was substantially improved and the plan attributed to Manstein was not a revolutionary departure from traditional military thinking but the concentration of superior force at the decisive point, a synthesis of "materialism and military art". The German army committed all its armoured units to the offensive and had it failed, would have had no mobile units to resist an Allied counter-offensive. Casualties were high but with the swift end to the campaign could be borne. The Luftwaffe was also fully committed, unlike the Allied air forces in which a substantial reserve was held back in anticipation of a longer campaign, which led to the Luftwaffe gaining air superiority but at a far greater cost in losses than that of the army. On 10 May, 347 aircraft were lost and at the end of the month 30 percent of the Luftwaffe's aircraft had been written off and 13 percent badly damaged. The concentration of units in the Ardennes was an extraordinary gamble and had the Allied air forces been able to bomb the columns, chaos could have been created. The "audacious" manoeuvre of Army Group A concerned only about twelve armoured and motorised divisions, while most of the rest of the German army invaded on foot, supplied from railheads. The Channel coast was a natural obstacle, only a few hundred kilometres from the German border and over such a distance, motorised supply from railheads could function, using the dense west European road network and by living off the land amidst the highly developed agriculture of western Europe, unlike in Poland, where it had been much harder to maintain momentum. Tooze concluded that although the German victory of 1940 was not determined by brute force, the Wehrmacht did not rewrite the rules of war or succeed only because of the ardour of German soldiers and French pacifism. The odds against Germany were not so extreme as to be insurmountable by better planning and a plan based on manoeuvre warfare. The German army managed to concentrate a hugely powerful force at the decisive point but took a gamble of great magnitude that could not be repeated if the initial attack failed. When a similar gamble was taken by the Germans against the Soviet Union in 1941, little was left in reserve. The Red Army had a greater margin of numerical superiority, better leadership and more room for manoeuvre; during Operation Barbarossa the Napoleonic principle of the concentration of superior force at the decisive point, was impossible to achieve. In the 2014 edition of Breaking Point, Doughty wrote that in a 1956 publication, Fuller wrote that the Battle of Sedan was an "attack by paralysation" that he had devised in 1918 and incorporated into Plan 1919. Doughty wrote that although the Germans hoped for a quick victory there is little evidence to support Fuller's view and that if thinking later labelled Blitzkrieg were influential in the German officer corps, only those like Manstein and Guderian had fully accepted them. The disagreement between Kleist and Guderian that led Guderian to resign on 17 May showed the apprehensions of the German high command about the speed of movement and vulnerability of the XIX Panzer Corps. Doughty suggested that the development of the Manstein Plan showed that the force sent through the Ardennes was for a familiar Kesselschlacht strategy of encirclement and annihilation. Twentieth century weapons were different but the methods little different from those of Ulm (1805), Sedan (1870) and Tannenberg (1914). When German forces broke through on 16 May, they did not attack French headquarters but went west, in the manner of cavalry raids in the past. Doughty wrote that Fuller had called the advanced forces of the German army an armoured battering-ram covered by Luftwaffe fighters and dive-bombers acting as flying field artillery, which could break through a continuous front at several points. The XIX, XLI and XV panzer corps had operated as the leading force through the Ardennes but the most effective Allied resistance to the south and south-west of Sedan, was reduced by the combined operations of infantry, tanks and artillery, a fact overlooked for long after 1940. Luftwaffe bombers had not acted as flying artillery and the main effect they had occurred on 13 May when bombing collapsed the morale of the French 55th Division. Air attacks helped the ground forces to advance but destroyed few tanks and bunkers, which were taken by the skill and determination of German infantry, sometimes helped by the fire of anti-tank guns, accompanying guns and a few tanks. Fuller's writing was in the vein of much of the early reports of the Battle of France but since then, new studies had added nuance, dwelling on the complications and chaos of the military operations. The Manstein Plan led to much more than a simple tank rush through the Ardennes and the fields of northern France, the toughness and training of the German infantry should be recognised, along with the efforts of the engineers and artillery, that got the XIX Panzer Corps across the Meuse. Doughty also wrote that the success of the German army, could not adequately be explained without reference to French mistakes. French strategy was unusually vulnerable to an attack through the Ardennes; operationally, French commanders failed adequately to react to the breakthrough of massed panzer forces. Tactically, the Germans were often able to overcome French defences that usually were weak. French military intelligence failed to predict the main German attack, expecting it to be in central Belgium as late as 13 May. Intelligence made the elementary mistake of noting information that fitted with their assumptions of German intentions and paid insufficient attention to German capability and information suggesting that they were not conforming to expectations. Doughty wrote that the French failure was caused by an inadequate military system and had much to do with the success of the German invasion. The French had prepared to fight a methodical battle based on massed firepower against an opponent that gave emphasis to surprise and speed. French training for a centralised and slow-moving battle left the army incapable of hasty counter-attacks or bold moves. The French army lost the initiative and were overrun at important points and then deep German penetrations made the disruption of French command arrangements worse. It is common in the literature to call the Manstein plan Operation Sichelschnitt and this had led to a misunderstanding that this was the official name of the plan or at least of the attack by Army Group A, the real title was Aufmarschanweisung N°4, Fall Gelb as issued on 24 February 1940 and the manoeuvre through the Ardennes had no name. Sichelschnitt originated in this context as a literal German translation of "sickle cut", a catchy expression used after the events by Winston Churchill. After the war, it was used in the writings of German generals. 1 2 3 Jackson 2003, p. 30. ↑ Frieser 2005, p. 81. ↑ Frieser 2005, p. 92. ↑ Halder 1949, p. 28. ↑ Guderian 1976, pp. 89–98. ↑ Tooze 2006, p. 373. ↑ Tooze 2006, pp. 374–375. ↑ Tooze 2006, pp. 376–377. ↑ Tooze 2006, pp. 378–379. ↑ Tooze 2006, p. 380. ↑ Doughty 2014, p. 341. ↑ Doughty 2014, pp. 341–342. ↑ Doughty 2014, pp. 343–344. ↑ Frieser 2005, p. 60. Ciano, Galeazzo (1946). The Ciano Diaries, 1939–1943: The Complete, Unabridged Diaries of Count Galeazzo Ciano, Italian Minister for Foreign Affairs, 1936–1943. 2. 9 September 1942. London: Doubleday. OCLC 245645. Doughty, R. A. (2014) . The Breaking Point: Sedan and the Fall of France, 1940. Stackpole Military History (Stackpole, Mechanicsburg, PA ed.). Hamden, CN: Archon Books. ISBN 978-0-8117-1459-4. Frieser, K-H. (2005). The Blitzkrieg Legend (English trans. ed.). Annapolis, MD: Naval Institute Press. ISBN 978-1-59114-294-2. Guderian, H. (1976) . Panzer Leader (Futura repr. ed.). London: Michael Joseph. ISBN 978-0-86007-088-7. Halder, F. (1949). Hitler als Feldherr [Hitler as War Leader] (in German). München: Münchener Dom-Verlag. OCLC 2150152. Jackson, Julian (2003). The Fall of France: The Nazi Invasion of 1940. New York: Oxford University Press. ISBN 978-0-19-280300-9. Tooze, Adam (2006). The Wages of Destruction: The Making and Breaking of the Nazi Economy. London: Allen Lane. ISBN 978-0-7139-9566-4. Vaïsse, Maurice (2000). Mai–juin 1940: défaite française, victoire allemande, sous l'oeil des historiens étrangers [May–June 1940: French Defeat, German Victory, In the Eyes of Foreign Historians]. Autrement. Collection Mémoires (in French). Paris: Éd. Autrement. ISBN 978-2-86260-991-1.
Cooper, M. (1978). The German Army 1933–1945, Its Political and Military Failure. Briarcliff Manor, NY: Stein and Day. ISBN 978-0-8128-2468-1. Doughty, R. A. (2014) . The Seeds of Disaster: The Development of French Army Doctrine, 1919–39 (Stackpole, Mechanicsburg, PA ed.). Hamden, CT: Archon Books. ISBN 978-0-8117-1460-0. Hinsley, F. H.; et al. (1979). British Intelligence in the Second World War: Its Influence on Strategy and Operations. I. London: HMSO. ISBN 978-0-11-630933-4. May, Ernest R. (2000). Strange Victory: Hitler's Conquest of France. London: I.B.Tauris. ISBN 978-1-85043-329-3. Rowe, V. (1959). The Great Wall of France: The Triumph of the Maginot Line (1st ed.). London: Putnam. OCLC 773604722.